David and Michelle Plachte-Zuieback have been professional stained glass artists, working in Northern California, since 1978. They have focused their studies in stained glass design with Master designers such as Ludwig Schaffrath and Johannes Schrieter, in architectural glass design and with Dan Fenton, in kiln-fired glass fusing and sandblast etching techniques. In 1978, they created their studio in Willits, California, executing commissions for residences, businesses, public and ecclesiastical buildings. As recipients of the 1983-84 California Arts Council Exemplary Arts in Education Grant, they expanded their interests to include group projects for public buildings. 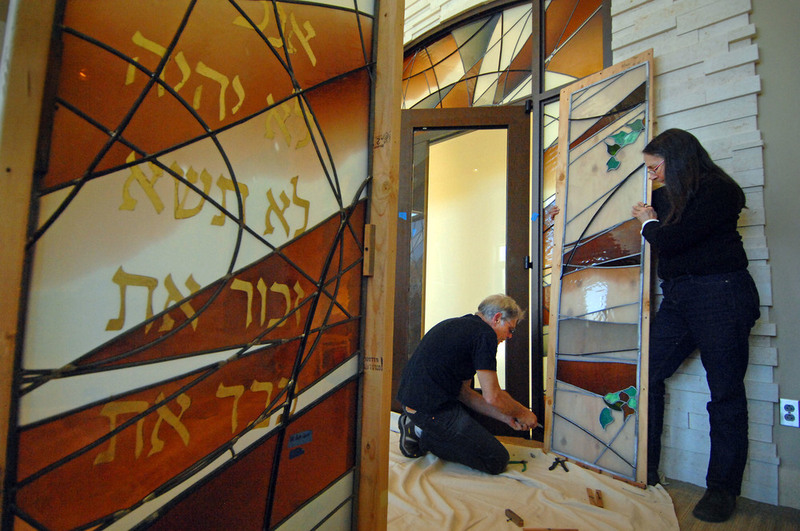 Michelle and David's interest and exploration of religious themes has been encouraged by their work as stained glass specialists for the UAHC Camp Swig Institute for Living Judaism, where they have offered an intensive stained glass workshop for High School students, from 1983 to 2000..
Michelle and David first exhibited their Jewish ritual plates at the Temple Isaiah Festival of Jewish Artisans, in Los Angeles, in 1984, and have continued the development of these objects with showings in Chicago, San Francisco, Denver, New York, Atlanta, and annually, in Los Angeles. Currently, David and Michelle specialize in the design and fabrication of stained glass windows for synagogues, working for clients throughout the U.S.
David and Michelle work as a team, collaborating on all aspects of research and design, fabrication and installation, from their studio in Santa Rosa, California. It is a great responsibility to create art work for a worship space for a community, especially stained glass windows which have a profound impact and longevity. Each project we take on is different but the goals are always the same: to beautify a sacred space with meaningful, inspirational and monumental glass work, conducive to prayer. Frequently, our work is the focal point of a sanctuary, the jewel in the crown of a new building or renovation.